As our global population continues to grow, many are turning to poultry meat and eggs to help feed the world. But intensive poultry farming is not without its challenges. At UNE's Poultry Hub Australia, director and scientist Dr Tamsyn Crowley is working closely with industry to improve chicken health and ultimately meat and egg production. With her colleagues at Deakin University, she has developed a world-first, non-invasive scientific test for bird stress. The Poultry Hub, and UNE’s world-leading Poultry Science researchers in the Faculty of Science, Agriculture, Business and Law have a long history of collaboration with the poultry industry. Their work is typical of UNE's research quality in Agricultural Sciences and Animal Production, recognised in the Australian Research Council’s most recent ‘Excellence in Research for Australia’ National Report. "Previously there was only one measure of a bird's stress hormones, achieved through a blood test," said Dr Crowley. "But you've only got 45 seconds to pick the bird up and take a blood sample to measure those levels before you've stressed the chicken out. We sought to come up with a better objective measurement." Dr Crowley's team discovered that, as in humans, the biomarkers in chickens that regulate biological processes are very sensitive indicators of stress. The test they have devised may even be used on unfertilised eggs, eliminating the need to take blood samples from chickens altogether. "Many of the welfare demands placed on the poultry industry are based on public perceptions and interpretations, making it difficult to make objective assessments," Dr Crowley said. "Our test will enable the industry to provide accurate scientific information on the welfare status of their production systems at the flock level and enable auditors to directly test bird welfare during routine inspections." Dr Crowley was one of the first postdoctoral researchers appointed to the Poultry CRC (with its successor now known as Poultry Hub Australia) and she relishes the opportunity to help translate science and research into industry practice. 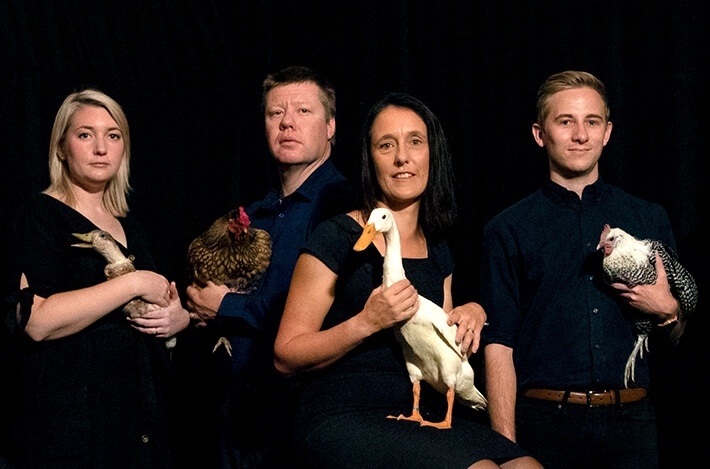 The not-for-profit hub that she now leads is dedicated to helping Australia achieve sustainable, ethical poultry production (including chicken meat, eggs, ducks and other poultry species) in the face of population growth and climate change, with a particular emphasis on nutrition, health, welfare and biosecurity research. "More and more poultry farmers are now calling me with real-world problems to solve, which is the highlight of my job," Dr Crowley said. "I love trying to find solutions to problems; that's what drives you as a scientist. At the Poultry Hub we invest in research that is relevant and will have a direct impact on the poultry industry - an industry that faces some future challenges." Far from seeing challenges around bird health and welfare as negatives, Dr Crowley regards them as opportunities. "When you improve the wellbeing of birds, you improve production and the whole process," she said. "We have a massive opportunity right now to get young people with fresh ideas engaged in the poultry industry and to enlist their help in solving these problems."